Project Profile - Clean Ohio Revitalization Fund, Queensgate South Development Project - BJAAM Environmental Inc.
A Round 2 CORF project, this 17-acre site, comprised of five parcels, was used for numerous industrial purposes dating back to the late 1800’s including foundry operations and scrap metal recycling in the later portions of the 1900’s. 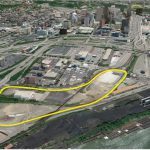 The site is located in downtown Cincinnati within walking distance of the Ohio River and the major-league stadiums. Due to the historic uses of the site, PCBs and metals in soils were driving the remediation. The remediation was completed through the Ohio VAP and the US EPA Region V due to the presence of regulated levels of PCBs. A site specific risk assessment was completed in accordance with the Ohio VAP to address COC concentrations in soil and groundwater not associated with PCBs. In order to satisfy US EPA requirements, a total of four (4) Remedial Action Plans were completed in accordance with the US EPA Self Implementation guidelines 40 CFR Part 761.61(a). The four (4) RAPs were approved and implemented. Contractor specifications and RFQs were requested for field remediation contractors, waste haulers, Ohio VAP certified laboratories, utility contractors, and waste disposal facilities. Contractors were selected both on price as well as qualifications to complete the work. A total of approximately 1,200 tons of PCB impacted soils were excavated and transported to approved facilities in Ohio and Michigan for disposal. Certified caps were installed on selected parcels for remaining levels of COCs and retaining walls constructed on the parcels to support the caps. In addition, on-site utilities were upgraded and/or installed new to support the proposed final development on the site. The site development will include an array of uses, including storage, high technology office, warehouse, distribution, office/distribution, and light manufacturing. The site remediation is complete and the VAP NFA was issued by the Certified Professional in October 2009. A CNS was issued on April 18, 2011. BJAAM was responsible for the administrative reporting requirements as well as invoicing through ODOD and the applicant (City of Cincinnati) and maintaining compliance with the approved PACE.